new, buy and watch the krav maga only version of combatant online right now! combat survival is considered by many experts as the most devastating israeli martial system. in cs, youll learn to defeat any attackers, including attackers armed with knives, guns, bottles, baseball bats, etc. in addition, youll learn how to control or debilitate your opponent immediately irrespective of size, training background or experience level. most importantly, youll see immediate results with cs's easy to learn reality based training methodology. the system is based on crucial and straightforward moves that you must know to save your life or to become a devastating hand- to-hand combat expert! cs is a complete system, covering all aspects of real hand-to-hand combat and weapons training. the effectiveness of the techniques has been proven time and time again, and they are taught to the most elite commando units and swat forces in israel and around the world. equally important to the physical and technical benefits, youll also be training your psyche to confidently handle any of lifes innumerable challenges. the implementation of the british mandate. in this same year the jews formed an underground army known as the haganah (the hebrew word for defense) to deal with the ongoing conflict with arab gangs, and in anticipation of the creation of a jewish state promised to them by the british in the balfour declaration. throughout its existence since that time, the little region in the middle east now known as israel has had to fight daily in order to survive. completely surrounded by its enemies at all times, it has always been totally outnumbered in its battles. in response to these overwhelming variables, the israelis developed systems of combat that had at their core a particular emphasis on mental toughness to overcome any odds, versatility to deal with any attacker, innovation to always be ahead of its enemies, and practical but deadly tactics executed with technical efficiency. the formality of traditional defense systems was abandoned out of necessity, in favour of methodologies that instead valued rapid, instinctive learning. it is these philosophies that have not only helped israel and its citizens to survive in what is essentially a war zone, but to gone on to form one of the most formidable and respected armies in the world. throughout the globe today, everyday citizens recognize the efficacy of israeli martial arts and what it can do for them as individuals. currently there are several forms of ima in existence, each with the common thread of survival and reality based techniques as their main emphasis. some are used for basic infantry (krav maga) within the israeli defense forces, while others are reserved for more elite units within the special forces (kapap, lotar, etc.). it was back in the seventies that moni aizik, then a senior member of elite commado unit, was approached by senior staff to improve upon the already existingsystem of close quarter combat used by the more elite units. the system that he developed at that time, incorporating various israeli and japanese styles, has evolved into what is now referred to in north america as combat survival. until recently the techniques from the system were exclusively available to special military and civilian groups. for the first time it is now available to north american and european civilians. directly from the tip of the spear: the most elite israeli commando units techniques for armed and unarmed combat. now everyday civilians can learn the most sought after system without having to go through years of grueling military training. combat survival is a product of the most realistic and competitive combat testing grounds around. taking the most useful elements taught in one of the toughest military environments in the world, the israeli special forces, in addition to the most practical elements proven time and time again in the no holds barred octagon of ultimate fighting, and mixed with olympic level martial arts training, combat survival has the requisite training components to teach anyone how to survive any street situation.  defeat any attackers, including attackers armed with knives, guns, bottles, bats, etc.  become a devastating hand-to-hand combat expert!  taught to the most elite commando units and swat forces in israel and around the world! despite the no nonsense name of combat survival, the self-defense system also has at its core basic tenets that help guide individuals throughout their daily living. the same way its country of origin has had to overcome severe limitations and weaknesses in order to survive, combat survival helps empower the individual with the requisite mental and emotional tools (in addition to the obvious technical and physical ones), that help one to properly navigate through lifes difficulties. as such, in combat survival students are taught to go beyond the physical and explore a side of their consciousness they are not used to confronting. it is in this way that the system helps deal with the many challenges one can encounter in the day to day. fundamental to this idea is the awareness of ones limitations and strengths. it is the consciousness of those limitations that makes us humble as individuals, another major value inherent to the system, but it is the overcoming of those limitations that give confidence and an indomitable spirit when facing future obstacles. the constant emphasis on pushing forward no matter the odds reflects a can do attitude, and one of continuous improvement.the training for cs places particular emphasis on a positive state of mind as an approach to everything in life. as such the attitude is not everything good or bad happens for a reason, but to quote moni aizik, always strive to see the positive even while facing the worst circumstances. it is this philosophy that helps develop survivors on the battlefield, champions in the ring, and winners in life. in order to be a winner, you have to think like a winner. you have to have a positive outlook, and never, ever give up. and, irrespective of the outcome of lifes challenges, it is from this constant struggle of facing obstacles that character and confidence is developed. not a shell that exists to impress others, but true inner strength that comes from a well defined and well developed sense of self. one way of exercising this inner strength is by participating in a daily workout (physical or mental) that challenges the individual psyche. one should strive to partake in as rigorous a mental or physical training regime that one can, and in so doing continually developed character at any age in life. as such, the abuse of any substances is to be avoided, and the enjoying of lifes pleasures done so in moderation. that takes time to completely internalize and master; but consistent and diligent training in combat survival facilitates the development of the required skills on this journey to self-mastery. moni started training in judo and jiu jitsu at the age of 8 under opa schutte, himself 2 generations away from the founder of kodokan judo, jigoro kano. throughout his youth, moni virtually dominated israels competitive scene, winning national titles 7 times. deciding not to try for an olympic birth in hi s late teens, he opted instead to shift his energy to becoming a member of one of the worlds most clandestine and sophisticated military units, responsible for counter-terrorism and intelligence gathering behind enemy lines. in the 70s, moni was asked to improve upon the army's existing hand-to-hand combat system, using his extensive knowledge of reality based jiu jitsu and competitive judo, specifically for the use of their special forces. 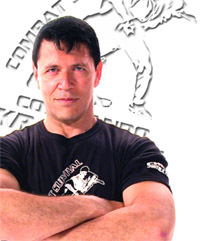 blending the lethal trinity of krav maga, jiu jitsu, and judo, he founded this new system, eventually calling the civilian version combat survival. as such, one factor that has always separated moni from the typical krav maga instructor is his depth and range of knowledge in other practical self-defense systems. after finishing his tour with the military, he would frequently travel to japan to study the technical wizardry of world judo and sambo champions isao okano and katsuhiko kashiwazaki. in the meantime, his club in israel, maccabi tel aviv, was quickly becoming recognized as the defacto national training center, and would be the seed to eventually produce the nations first olympic and world silver medalist in judo, yael arad. moving to north america in the eighties, he would go on to demonstrate his abilities in both elite instruction and business, as he would establish one of the most successful schools in canada, the samurai club, which would itself house another generation of champions and world famous no holds barred fighters, including ultimate fighting champion carlos newton, japanese shooto star joel gerson, and many others. the samurai club literally dominated every competition, either provincial or national, that it sent fighters to. the reason jiu jitsu is as big as it is in canada is primarily due to the clubs foundation of fighters (also including mark bocek, omar salvosa, etc.) who are all considered the best grapplers or reality based martial artists in the country. nevertheless, what distinguishes moni from most instructors in general is not only his ability to spot talent and develop it in a variety of disciplines, but more so his finesse in bringing out the champion in the average person, helping them reach levels they never thought they were capable of, physically and mentally. his latest succesful venture, edge combat fitness which he co-owns with his student joel gerson, is located in the north end of toronto, in concord, ontario. click below on the dvds to see the extensive list of dvds that moni has been in.